It’s going on 10pm and is a muggy 73° outside. A heat advisory is in effect until Thursday, Aug 12, 9:00 PM. I’m postponing my morning walks until next week, just to be safe. My walking buddy is still going. I got a call from our neighbors last Sunday morning; they were out for a Sunday drive when they ran across 2 childrens’ wagons near Palmyra. I hoped in the Blazer and headed out to look for them. I found them in an older couples’ front yard, chained to a tree along-side some garden tools and a very nice handled crock. 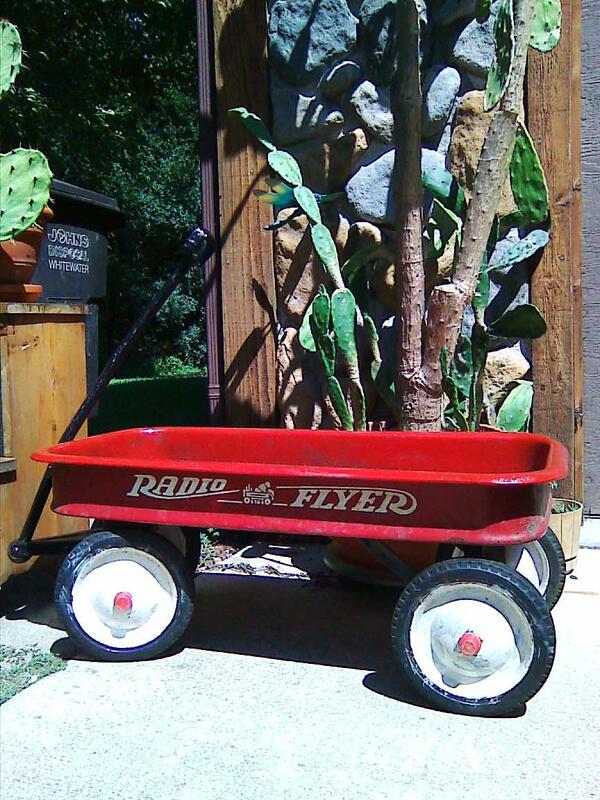 They had two wagons; one was a Radio Flyer #18, the other was a Blue Atlas. The Atlas really caught my eye, but was in sad shape with much rust, while the Radio Flyer was in good condition, albeit with a newer paint job on the wheels. I’m pretty sure the inside was also re-painted at some point. 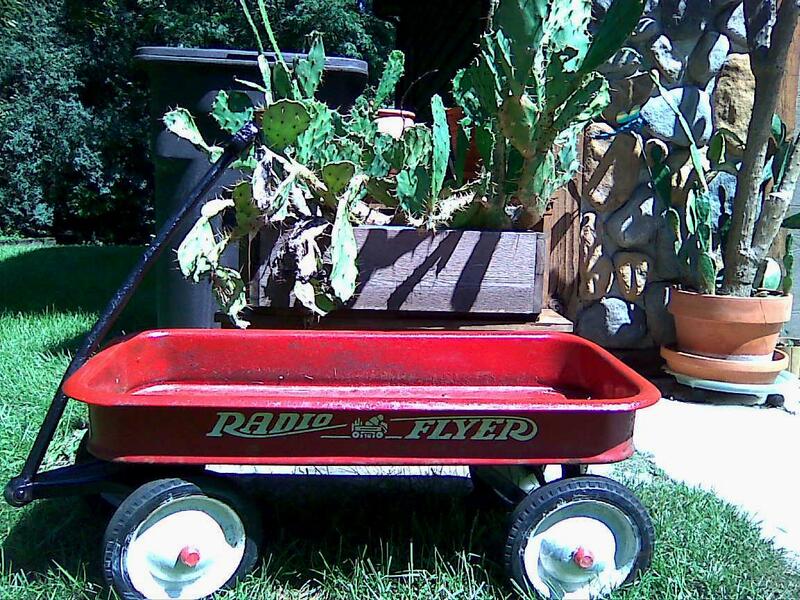 This view shows the Radio Flyer with a cactus my Mom had originally planted in a similar Radio Flyer, back in 1968-69. I will have to dig out the photos of the wagon where it was once parked at the Old Homestead, for comparison. The wagon will serve a dual purpose: ease of transport to and from the garage in late Fall, and again in early Spring when we bring it back outside again. DH is going to drill a couple more holes (it has 2 holes in it now) and seal-coat them for added protection from further rusting. 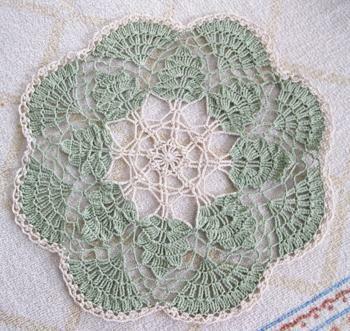 I’ve started another Woodland Lace Doily, for myself, this time. 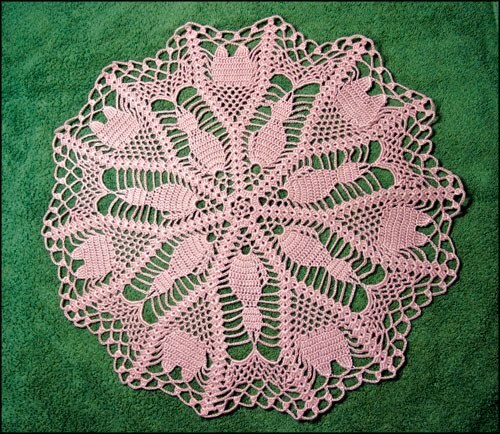 This is one of my favorite little doilies, and will go under my Tiffany lamp, when done. 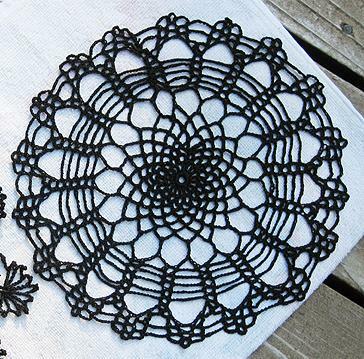 Then I’ll start on a Halloween theme doily. 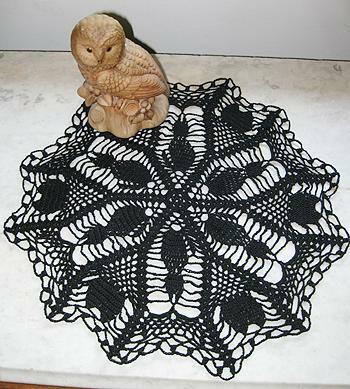 This is last year’s Halloween Black Cats Doily; I made two, one for myself and a pink one for my oldest daughter, CJ. Previous Captured: America in Color from 1939-1943 – 1900′s Black and Whites Next Coasting Along, Singin’ a Song….